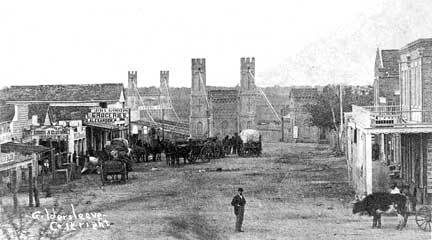 One of the best known images of early Waco is a figure of a man taken about 1872, in the middle of the dirt " Main Street" in front of the Suspension Bridge, built in 1870. The prosperous man with his hands — and two Colt revolvers — in his pockets was Seth P. Mills of Speegleville, recently returned from a cattle drive with his profits on his person, said Betsy Tracy, one of his many great-grandchildren. The future homesteader was born Aug. 19, 1841, in Dade County, Mo. After college, he enlisted in the Confederate army on Sept. 12, 1862, as an orderly sergeant of Company F, Smith's Regiment of the 3rd Missouri Cavalry. "For gallantry in battle and exemplary conduct as a soldier," he was promoted to lieutenant, according to The Confederate Veteran, Vol. XXIV. His command was disbanded at Corsicana in 1865, and the young Mills was left penniless in a strange land, biographers said. He recovered enough financially to move to Speegleville about 1870, where he met and married Margaret Frances "Fannie" Standifer on her 22nd birthday — Oct. 22, 1871. Speegleville, eight miles west of Waco, was named for Israel Washington Speegle, a blacksmith and farmer who came to the area from Jasper County, Mo., in 1849. A Baptist congregation, which was organized in 1859 as the Pleasant Grove Church, shared a building with the local school. The Speegleville post office operated from 1879 until 1929. Speegle was the first postmaster. Speegleville had a population of 25 in the mid-1880s and 50 by the early 1890s. In 1896 the community had two general stores, and the principal occupation of area residents was raising livestock. That year the Speegleville school district had 77 students and one teacher. Fannie Mills was born in 1849, in Milam County. She bore nine children (two of whom died as children) in the course of her 37-year marriage. She died July 5, 1909, in Waco, at age 59. Mills remarried in 1912 to Jennie Southgate, who owned the boarding house where he stayed in town, Tracy said. Seth P. Mills was 74 when he was killed Feb. 11, 1916, when stepping off a train platform in Bellmead. His son-in-law, Ben Gooch, also was killed in the mishap, which took place while Mills was campaigning for re-election to the Texas Senate. He was a member of the Waco City Council at the time of his death and was president of the McLennan County Confederate Association for several years. Southgate survived him, with the three sons and four daughters of his first marriage. The Mills offspring and in-laws "bought off" Miss Jennie, Tracy added. Meanwhile, Tracy's grandmother, Edna Mills Walker, sold the copyright of the picture of Seth P. Mills to photographer Fred Gildersleeve, a deal that upset the rest of the family, Tracy said. The image has gone on to be used in numerous Texas history books, and the now defunct Pete's Hamburger Stand, a Waco restaurant, used it in its advertising for many years, Tracy said. Three of Seth P. Mills, grandchildren are still living in Waco — Margaret Mills McDaniel, Emily Mills McKelvain and Richard Coke Mills Jr.
Construction of the Waco dam in the late 1920s forced several Speegleville residents to move their homes or businesses. Residents were forced to move again in the late 1950s and early 1960s because of the construction of the new Lake Waco dam. The original town site was destroyed, and Speegleville became a scattered collection of houses instead of an organized town. The Speegleville Independent School District was consolidated with the Midway Independent School District in 1980. SOURCES: Handbook of Texas, Online; Betsy Tracy interview, The Confederate Veteran, Vol. XXIV.